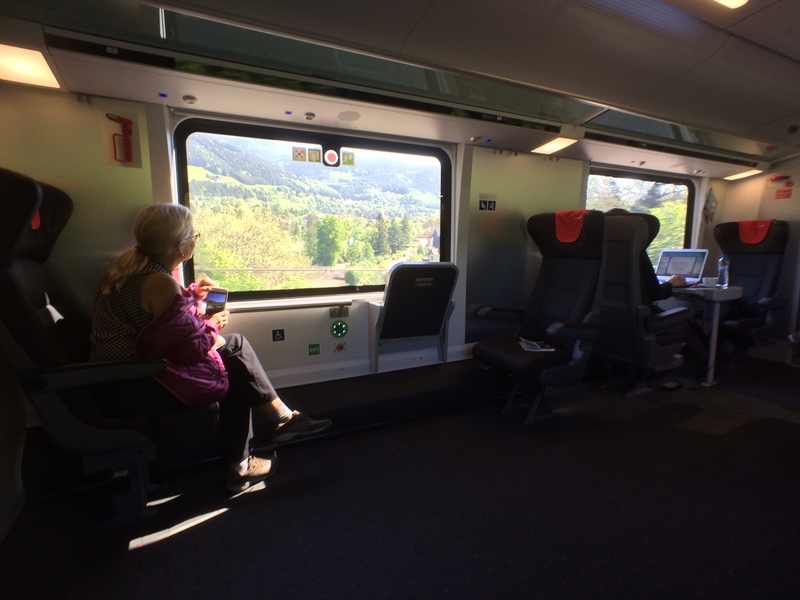 On Tuesday (“Mardi” in French), we went on the scenic train ride known as the Südbahn, the Austrian Southern Railway, over the Semmering Pass to Austria’s second largest city, Graz (pop. 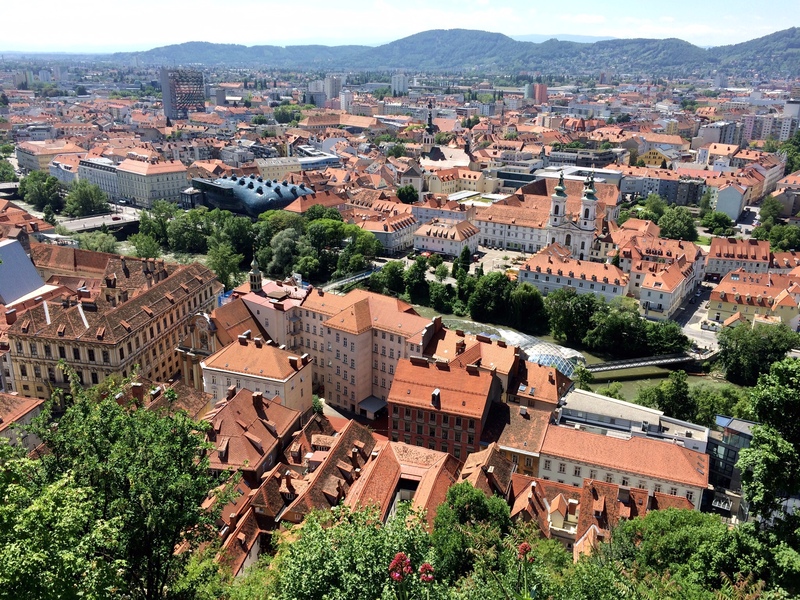 265,000), the capital of the Austrian state of Styria. 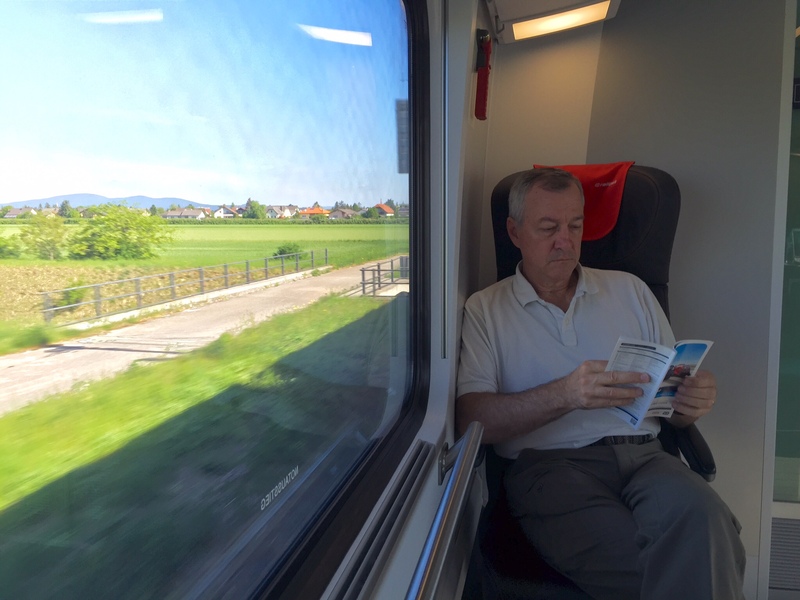 Leaving Vienna, the country’s largest city with 1,725,000 residents, we traveled through relatively flat countryside for about an hour at about 100 mph. But, we could see the mountains were going to climb off in the distance, the eastern-most edge of the Alps. 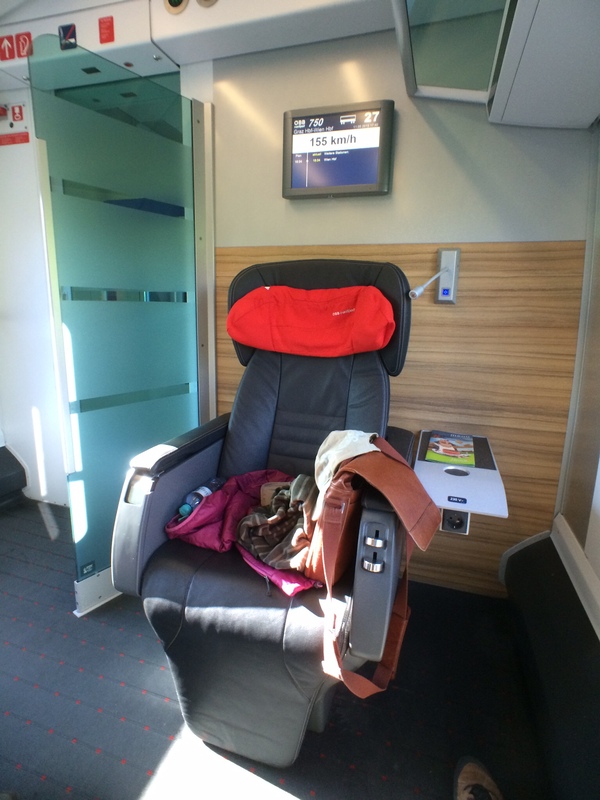 I mentioned earlier that we have Eurail passes that we upgraded to First-Class. Foreigners get a real break with Eurail. Our First-Class, Regional Pass is good for 10 travel days over a 2-month period in 4 countries: Germany, Austia, Hungary and the Czech Republic – all for only €500 each! First-Class is extremely spacious, as you can see in the photo, below. 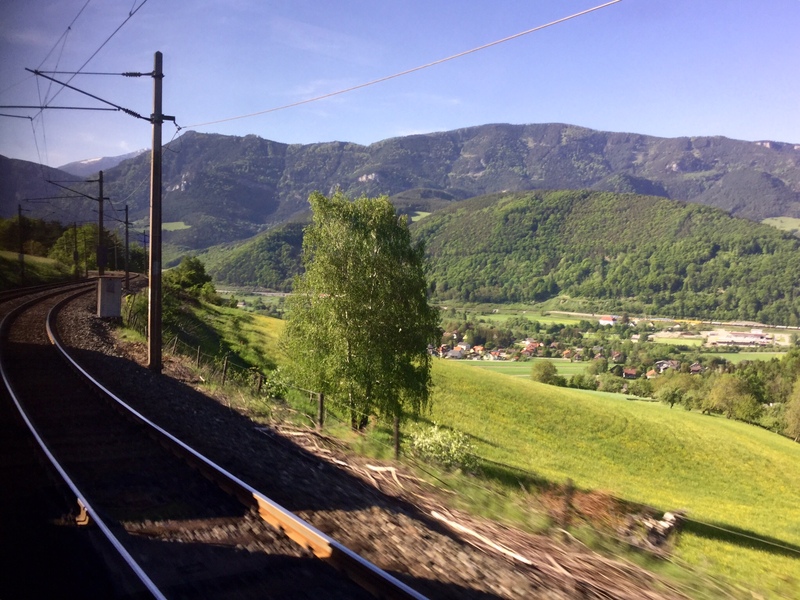 Most of the trains in this part of Europe, including the high-speed RailJet we were on for this trip, are electric, which allows them to accelerate really quickly, smoothly and silently. If you’ve ever ridden in an electric car, you’ll know what I mean. 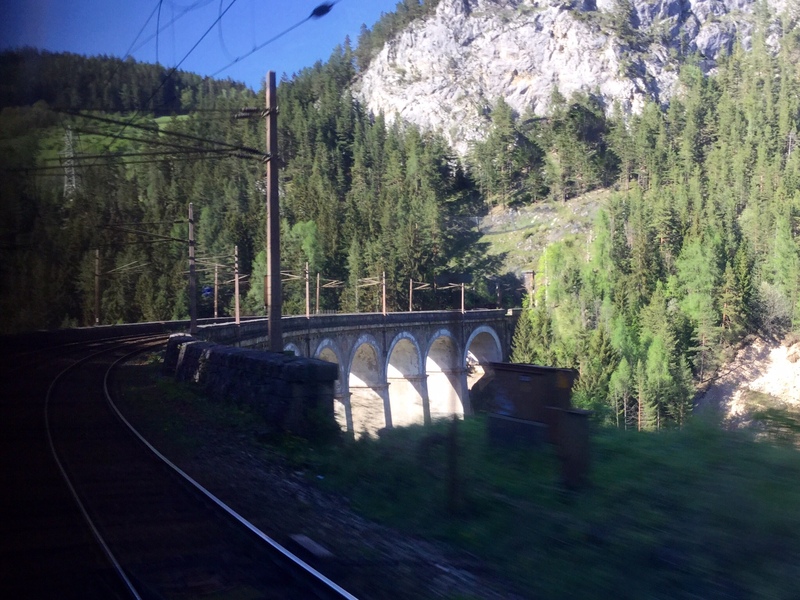 At any rate, as the grade steepened and the track began to wind and twist over the numerous viaducts along the route, we slowed down to around 45 mph going over Semmering Pass, elevation 3,166 feet above sea level, a little more than 2,500 feet higher than Vienna. 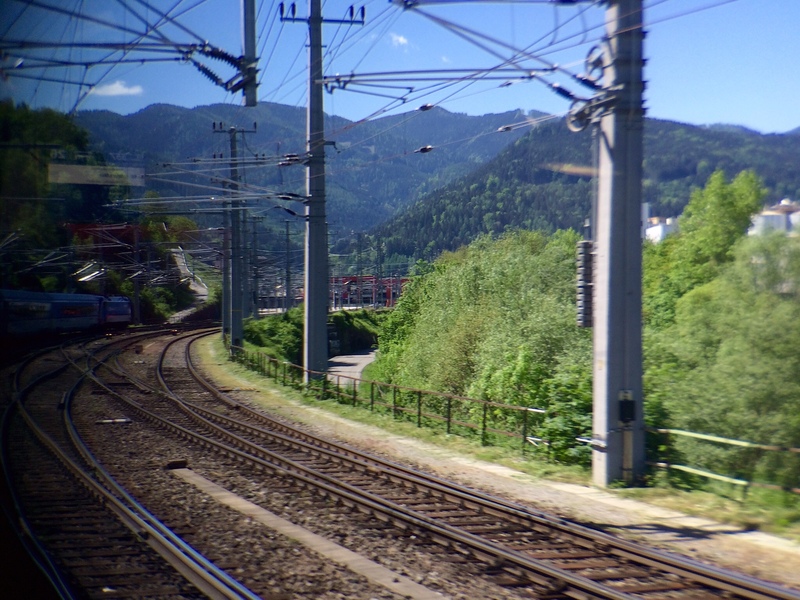 There’s always a jumble of overhead electric lines whenever you approach a station, like what you can see here as we pulled into Bruck an der Mur. 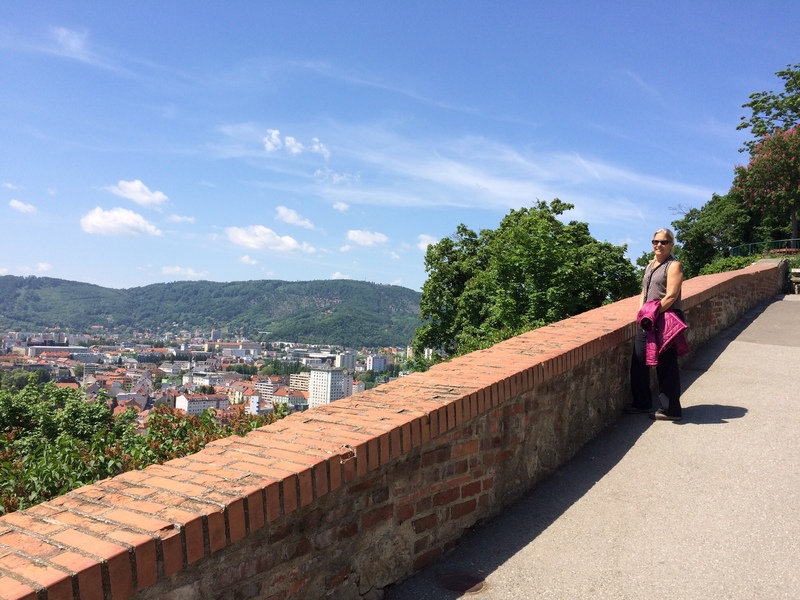 We had originally intended to end our trip in the mountain town of Semmering to go for a hike and then return to Vienna, but we made such good time that we decided to continue all the way to Graz, another hour or so further. 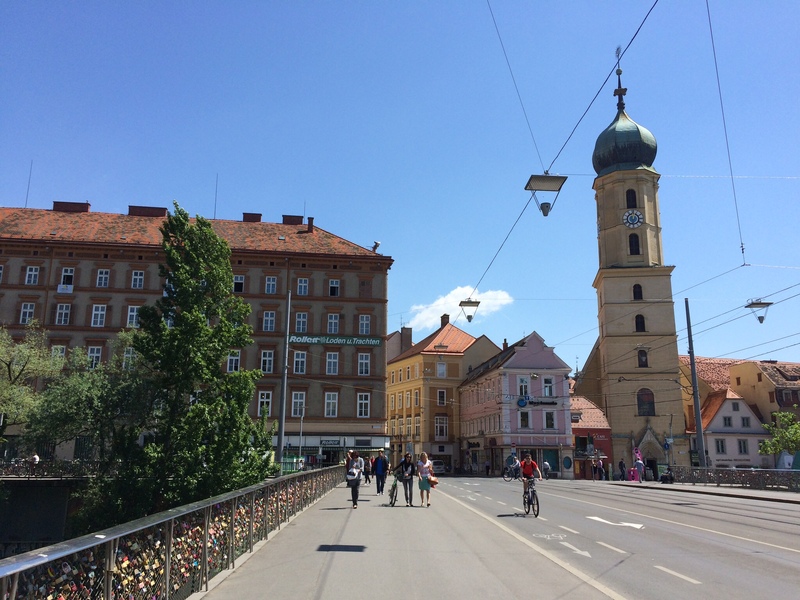 We walked east from the train station in Graz to the bridge over the Mur River into the old city. You can see the influence of the Ottoman Empire here in the minaret-like steeples. As in Paris, there’s a tradition here of attaching Love Locks to the bridge. 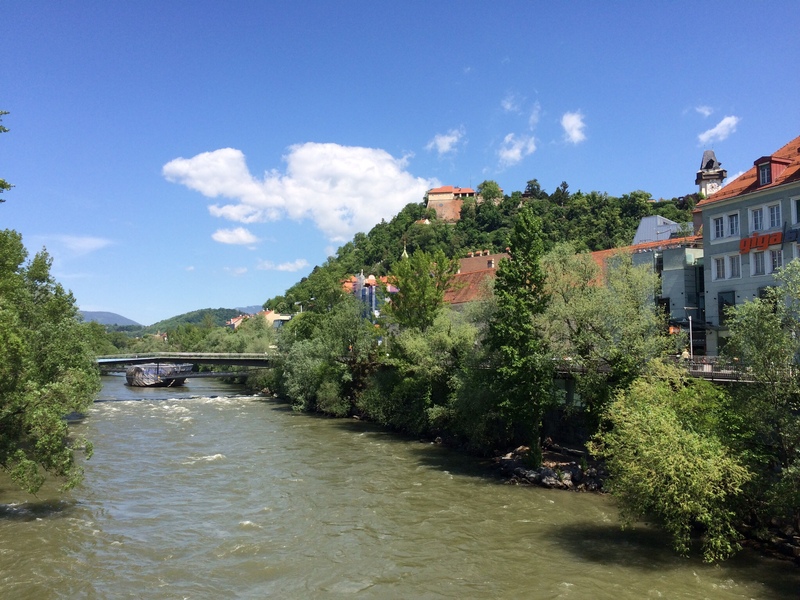 We paused briefly on the bridge to look upstream at the Murinseln, a restaurant constructed in the middle of the River, and to orient ourselves for our journey up to the top of the Schlossberg, which means “Castle Hill” in German; you can see it on the right in the photo, below. 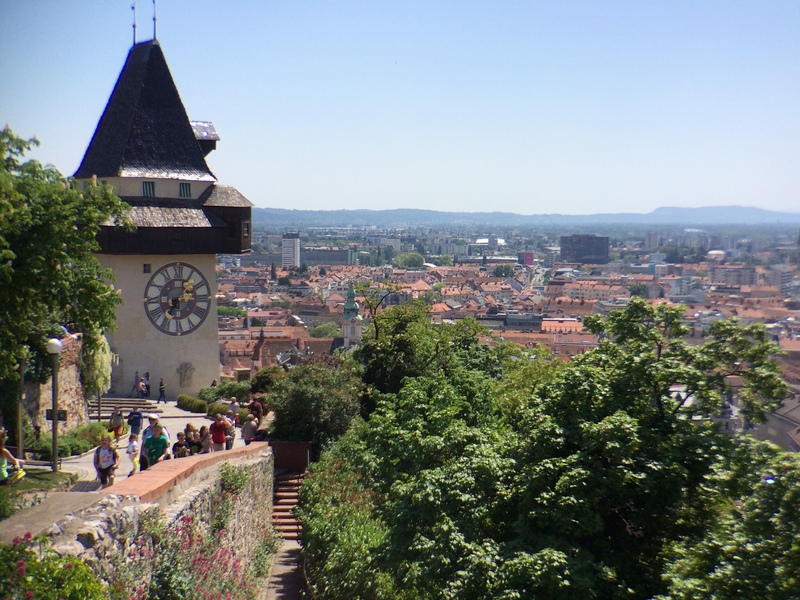 On the top is what’s left of the castle and on the right you can see the Uhrturm, the clock tower. 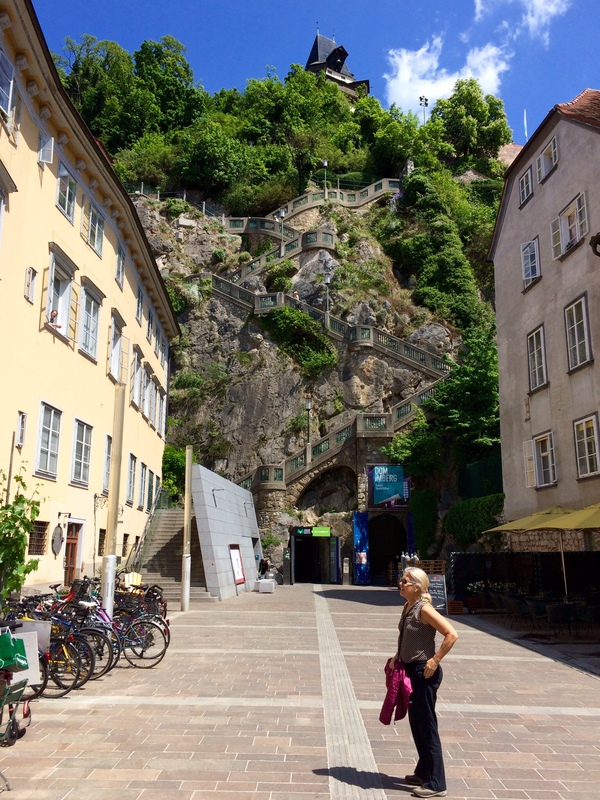 We stopped for lunch at the base of the 260-step staircase to the clock tower, but before hiking up, we decided to see what was in the tunnel at the base of the stairs. It turned out to be a tunnel built in WWII as a bomb shelter and I thought the entry sign said that the tunnel continued through the mountain and up to the top, so we paid to enter and then discovered that this section of the tunnel dead-ended into an elevator to the top. Having already paid, we decided to take the elevator up and then walk back down the steps. 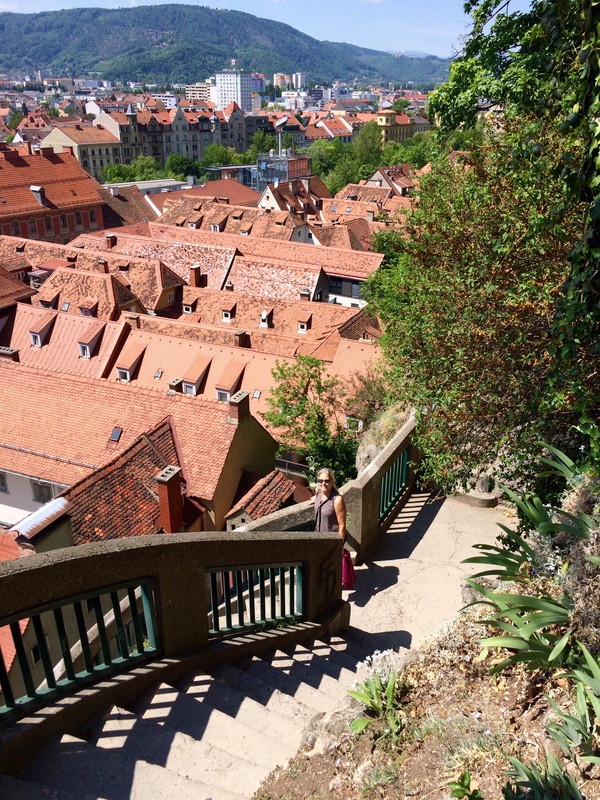 … where we had a nice view of the city, below. 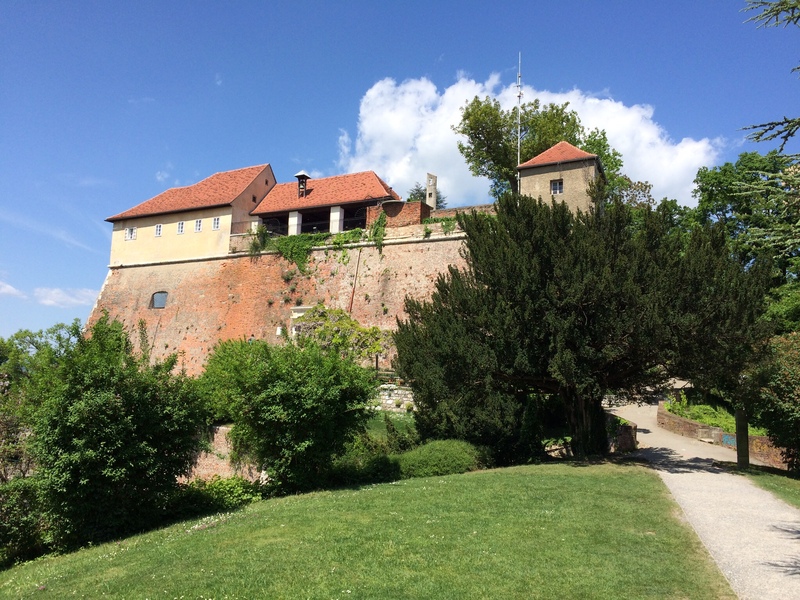 … and into the remains of the old castle. … to the steps that led back to where we had started. From there, we wandered along the street, poking into a few alleys. 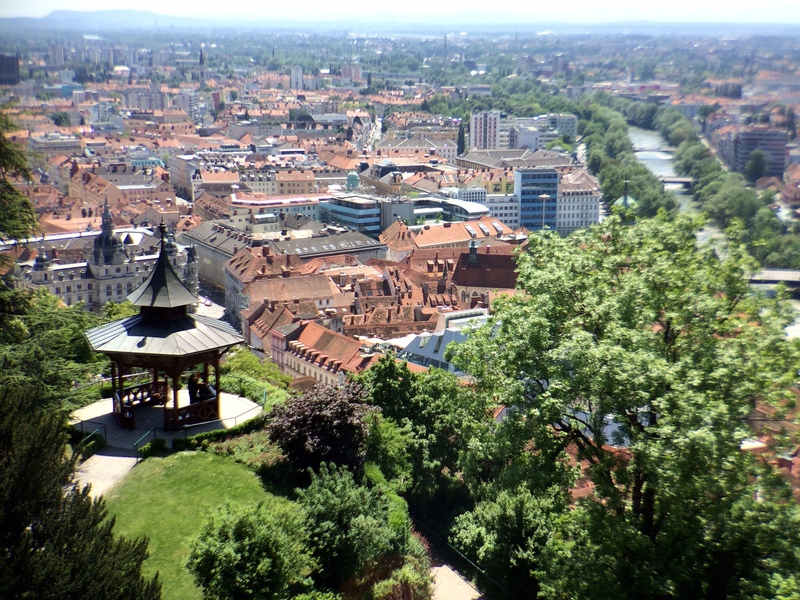 Graz is a university town and has a much more relaxed feel than Vienna. The guide books say it’s a great city to just wander around in without any particular plan and I would have to agree. 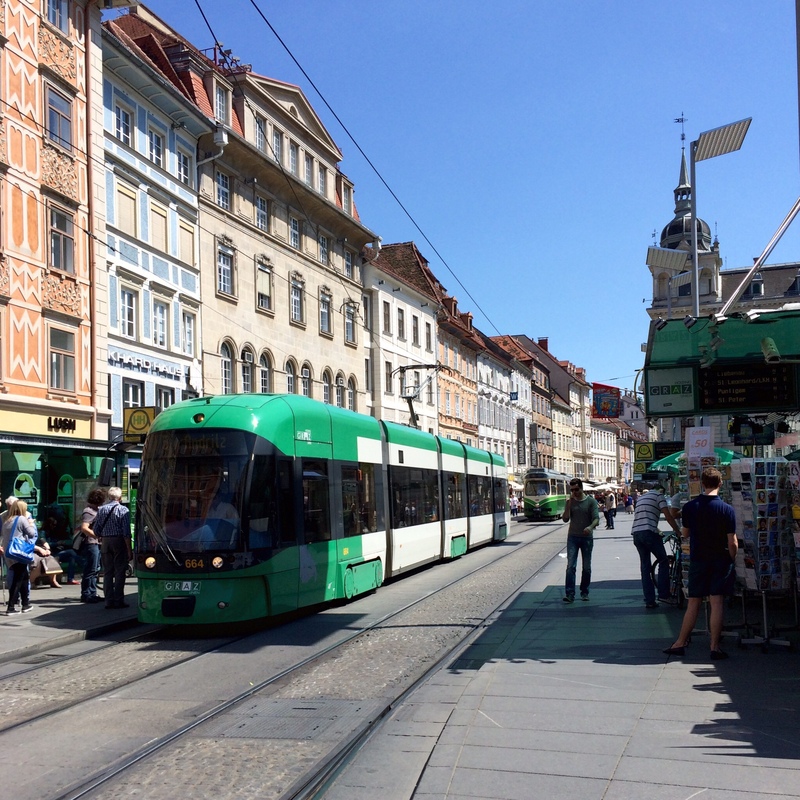 Ultimately, we hopped aboard one of the free trolleys and took it back to the train station. 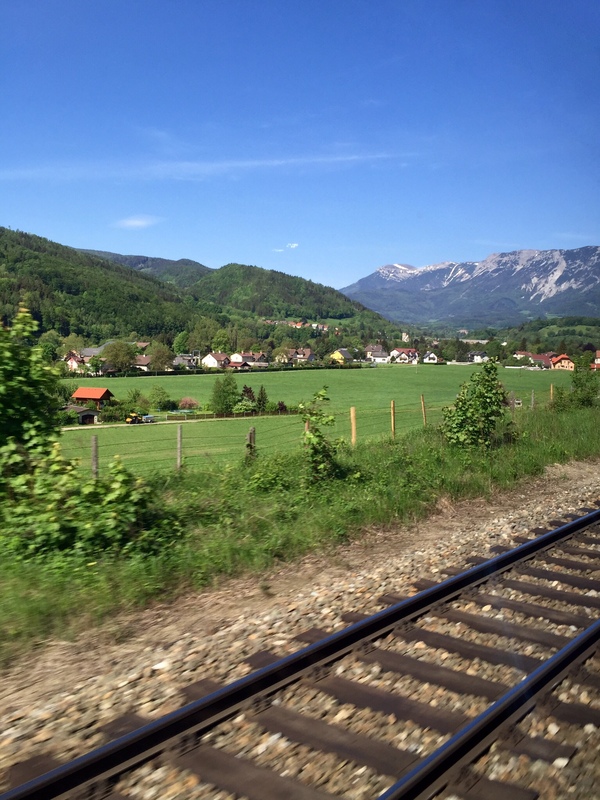 The ride back to Vienna was just as enjoyable as the ride to Graz. It was a beautiful day for an excursion like this. Here’s the valley on the Vienna side of Semmering. You can see the elevation is decreasing here. As we descended, the train picked up speed again, 155 km/h, just under 100 mph. How do you like the luxury of these First-Class seats? I guess the regular price tickets are too expensive for the locals; we usually had the First-Class cars pretty much to ourselves.